Most data charts in the NHS use Excel. This may be adequate for most purposes. But there are times when the richness of the data may not be fully exploited by the standard data types available in Excel. Other statistical and data science tools such as Python, and R provide a richer set of chart types and techniques to turn data into exciting images. Ive taken a data set published on 9 March 2016 by Monitor and NHS Trust Development Authority. (Note: These two bodies came together as NHS Improvement effective 1st April 2016. The excel data file also provides a great deal of detail on the 2015 staff survey. I have confined myself to the composite measure of the Staff survey. This varies from 3.29 to 4.0 with a median of 3.64 and follows a roughly normal distribtion with rather flat tails at both ends. Do Foundation Trusts (FTs) differ from Non-FTs? This is what the data looks like.. Ive shown a few rows from the top of the league table and a couple from the bottom. # this resets the levels of the category variable in the explicit order. That is a pretty impressive looking chart!! This is not based on statistical tests but at first glance it would appear that it would be fraught to predict the level of openness to learning from the staff survey summary score. There is also little or no separation between FTs and non-FTs. Surprisingly, the Trusts with a ‘Good’ rating on learning from mistakes have a higher staff score than ‘Outstanding’ Trusts. Likewise, Trusts with a ‘Poor’ score have a higher staff survey score than those rated ‘Significant concerns’. Data on population health is often presented as bar charts (single measure across many geographical units) or as line charts ( a single measure over time and across 1 or more areal units) . These charts are usually produced in Microsoft Excel. This might serve the purpose but Excel is designed more for business use and there are better ways of making the data come alive. The free statistical software package R and its many thousands of add-on ‘packages’ is relatively unknown in public health circles. The graphical packlage GGplot2 is particular, though not as straightforward to learn as Excel, opens the door to some amazing ways to visualise date. The aim is to show a time-series style chart with the year along the X-axis and a) the excess winter deaths index for Walsall plus its associated 95% confidence intervals, and b) the same data fro England together with its confidence intervals. I find it altogether rather muddled and confusing. In any case I elected not to show the confidence interval for England, since it is very narrow and therefore the actual EWDI value is good enough. The CI for Walsall is wide and is worth showing . A better alternative is to use R and the GGplot2 package, which gives me this rather more elegant graphic where the confidence intervals are shown as ribbons. I wondered whether to show the actual EWDI values for Walsall as a line that sits in the middle of the confidence band and after trying both options the chart with it left in looked rather prettier. I think this chart looks much more attractive, is clearer and instantly brings out the key message that Walsall’s excess winter deaths index generally tracks the England figure and is not systematically higher. There’s always been interest in how the world’s 2 largest emerging economies – India and China – are faring, both in absolute terms and relative to each other. One simple measure is exhange rate movements. The Bank of England publishes daily spot prices of all the world’s currencies against each of the 3 major reserve currencies, the US Dollar, Sterling and the Euro. It extracts daily spot prices of the Indian Rupee and the Chinese RMB against Sterling and the US Dollar from 1st Jan 2006 to the latest date and presents the data as 4 time series plots. On 16 Oct 2015 the Chinese Yuan traded at 6.35 to the US dollar, and 9.81 to the GB Pound. Note: this note and the accompanying chart are an example of how RStudio’s knitr package is used to produce ready to publish reports straight from R code without the need for cut and paste. This is a report on NHS Emergency Department attendances. The question is this: How does the hourly attendance figures vary by hour and day of week? The health and Social care Information centre publishes lots of data in various formats. 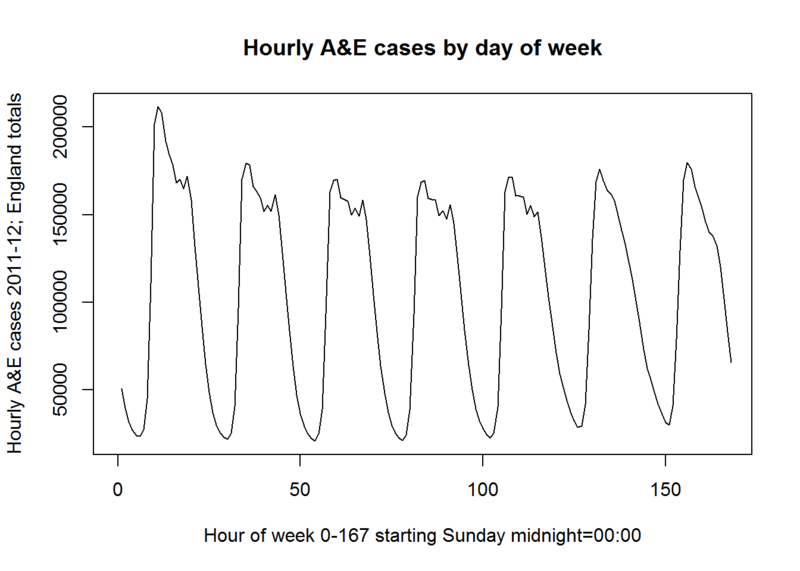 Data on ED attendance by hour and day of week (aggregate for all hospitals with an A&E Unit in England) for the years 2011-12 and 2012-13 were downloaded from the HSCIC website. 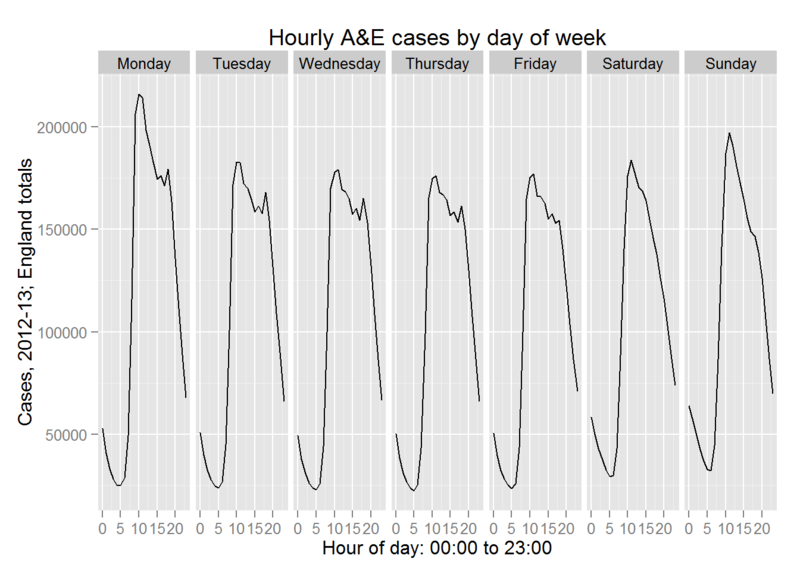 There is a clear ebb and flow pattern in the hourly number of cases that are seen in Accident and Emergency Departments in England. regardless of week day or weekend the peak hourly attendance occurs at around 10 or 11 am, with the trough in the early hours of the morning between 4 and 6 am. Whether or not this fluctuating pattern is justified by clinical need is another question.